If you’re a committed Velocity Frequent Flyer, a visit to the Velocity eStore will allow you to earn points when you shop online – at the click of a mouse. 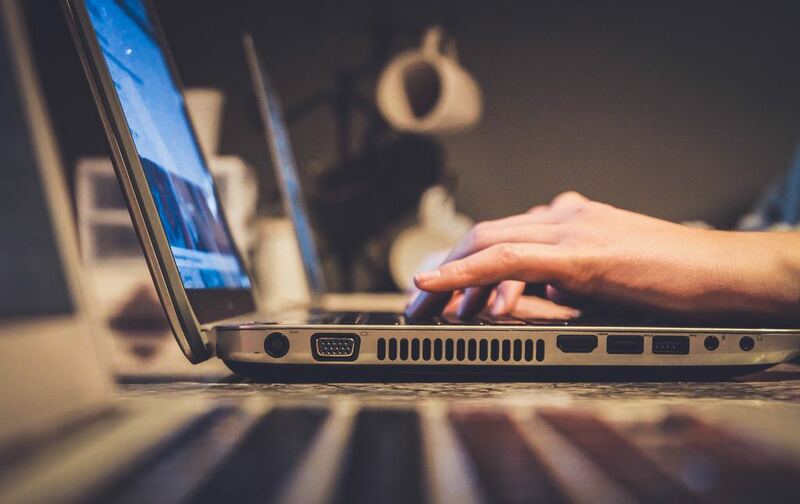 Read on to discover everything you need to know about Velocity Frequent Flyer shopping portal, and find out how you can use it to earn points on everyday purchases and one-off splurges in 2019. What is the Velocity eStore? 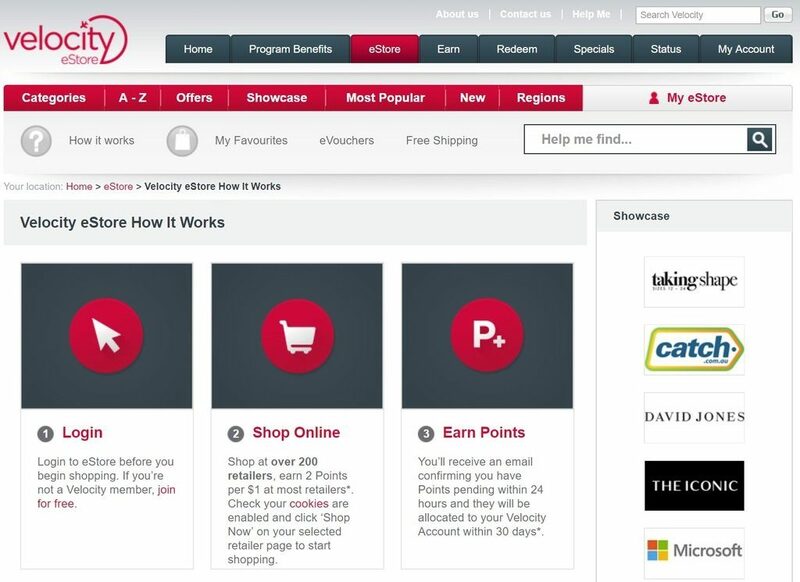 The Velocity eStore is Virgin Australia’s online shopping portal. 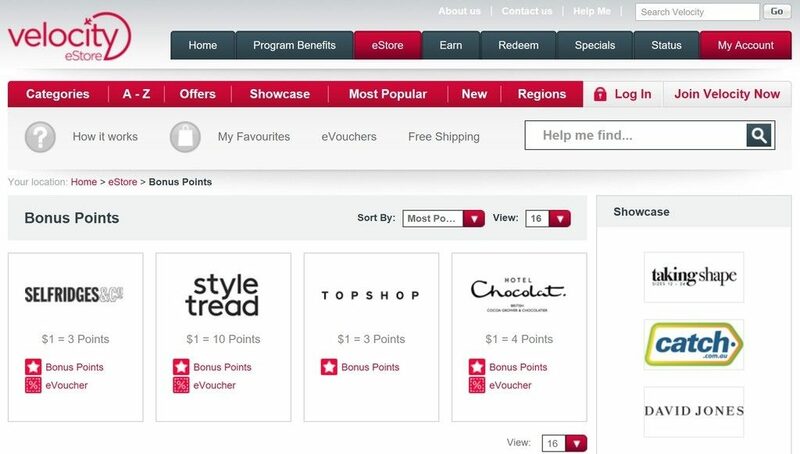 A similar concept to the Qantas Online Mall, it brings together a range of leading retailers, providing Velocity Frequent Flyers with the ability to earn points on purchases when logging in and clicking through to external merchants. And whilst Velocity points can’t be redeemed via the eStore (you’ll need to head to the Velocity Rewards Store for that), the opportunity to easily and quickly add to your stash of Velocity points could be quite compelling, as we’ll highlight below. Shopping at the Velocity eStore is surprisingly easy, and once you’ve started to do so, you’ll likely make it part of your everyday routine. We’ve put together a simple, step by step guide below to help you navigate it. Browse to the Velocity eStore website. Cookies will need to be enabled so that your purchases can be tracked. Earn points. Upon completing a purchase with a retailer, you’ll be sent an email confirming the points earned. Transactions will appear in your transaction history as ‘pending’ within 1 working day and your Velocity points will appear in your Frequent Flyer account 30 days after purchase. Take care not to leave the page before the transaction is complete. This will ensure that the Velocity eStore can track your purchase to completion to claim velocity points. Also note that once you leave the Velocity eStore to shop at an external site, you are bound by that retailer’s terms and conditions. Which merchants are linked to the Velocity eStore? 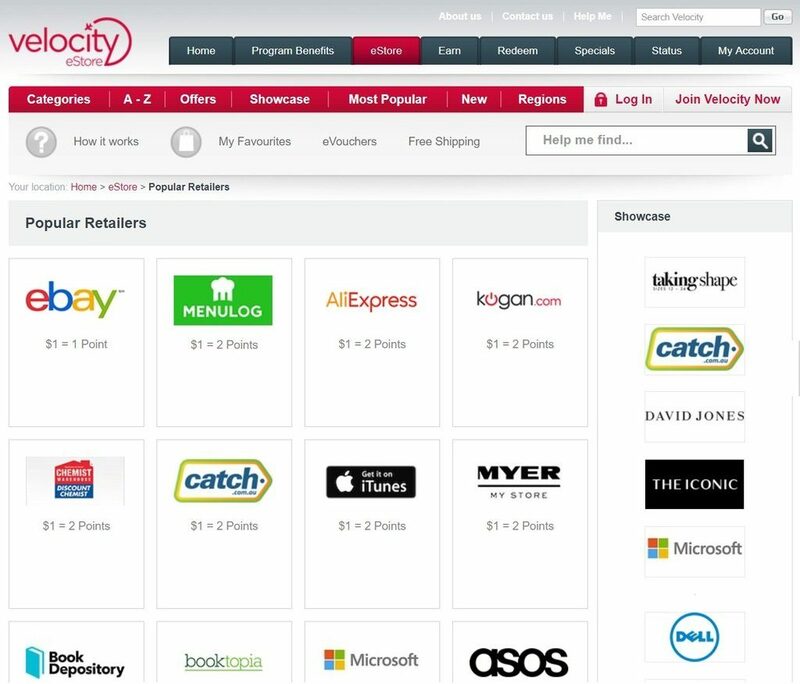 The Velocity eStore brings together a range of leading retailers that Australian consumers purchase from every day. At the time of writing, there are over 220 big name retailers in the eStore to choose from. Shop a range of brands including Country Road, GAP, Athlete’s Foot and Kidstuff. This category is absolutely loaded with the big names. Think Asos, BCF, Bonds, DKNY, Hard Yakka, Kathmandu, Lee, The North Face, Tumi, Top Shop and Veronika Maine. They’re all here! A number of the big chains are represented here, including Australian stalwarts, Myer, David Jones and Harris Scarfe. There are also Global behemoths like AliExpress, Bloomingdales and Marks and Spencer. This category will have you well covered with Apple, Dell, HP, Lenovo, Microsoft, Sony and The Good Guys. Here, you’ll find popular retailers such as Book Depository, Dymocks, iTunes and Scoopon. This is the weakest category, but that’s not surprising given the competition directly in that market. Popular home delivery meal service Menulog is included. Shop a number of large florists and smaller gift retailers. As you’d expect, this category is packed with big names. Shop from highly regarded brands such as Aveda, Clinique, Chemist Warehouse, Estee Lauder and Jurlique. There’s also StrawberryNet, The Body Shop and YvesSaintLaurent and more. This category is especially well covered. It features retailers including Bed Bath n’ Table, Freedom, Pet Barn, Pottery Barn, Sheridan and West Elm. The Velocity eStore connects Velocity Frequent Flyers with a range of sports and fitness brands. These include Anaconda, BCF and Rays Outdoors as well as a number of national footwear retailers. How many points can I earn at the Velocity eStore? The number of points on offer varies between retailers, with many merchants offering 2 Points per $1 spent. At the time of writing, Hotel Chocolat delivers the highest points haul, with an offer of 4 points per $1 spent. Bear in mind that there are also frequently bonus point promotions available (more on this below). These can boost your points haul even further. You can check the current earn rates for all retailers on the A to Z retailer page. From time to time, the Velocity eStore runs Bonus Points promotions. These offers are prominently displayed on the portal main home page. A history of these offers suggests that they are likely to be released at ‘peak’ demand times such as Christmas, New Year and Mid-Year sales, so it pays to return regularly to this page to check. Before you click through to shop with a retailer, a points calculator is located on the left of the screen. It allows you confirm the total Velocity Frequent Flyer points you’d earn for your purchase. This is a handy feature, and one that is currently lacking on the Qantas Online Mall. While shipping costs vary between retailers, the Velocity eStore includes a list of merchants who are prepared to ship items at no freight cost to yourself. This is a useful feature, and one that could save you significant money on shipping costs. 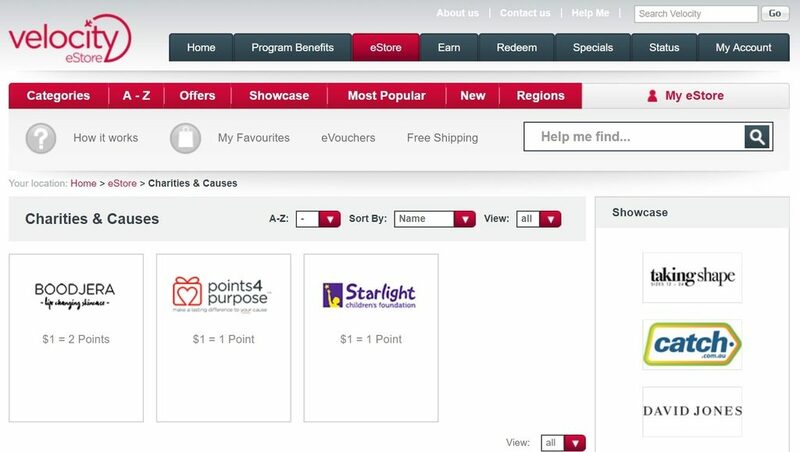 You can donate to charity via the eStore with a view to topping up your Velocity points balance. Additionally, these payments may be tax deductible with the ATO (check with your accountant). The Velocity eStore identifies any vouchers or sales available via merchants. This includes specific voucher codes, along with sales that don’t require a code to be entered. Your purchase needs to be tracked by the Velocity eStore for you to be credited with points. Before you shop at the eStore, it’s important to ensure that you have your cookies enabled and if unsure refer to the information here. Remember – you must visit the Velocity eStore first and only then click through to the retailer site. 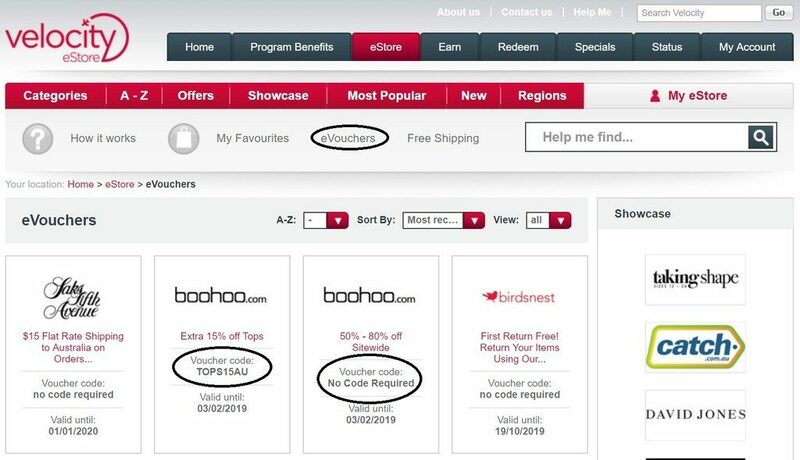 If you visit the retailer’s online site directly, or navigate away from Velocity eStore and come back to it, you will not earn Velocity points on your purchase. Transactions will appear in your transaction history as ‘pending’ within 1 working day and your Velocity points will appear in your Frequent Flyer account 30 days after purchase. Excellent! If you’re worried about your Velocity points dropping, set an appointment for 30 days time as a reminder. If they haven’t, contact Velocity to check on their status. And hang on to your confirmation email – having access to this documentation can makes it much easier to chase points if you need to down the track. While most items that you purchase will be eligible to earn points, some retailers may restrict some types of purchases or prevent points being earned. As an example, typically gift card purchases are excluded from eligibility for Velocity points. Each retailer’s terms and conditions are stated prior to entering its store, so make sure you read through these before committing to purchase. While shopping via the Velocity eStore usually makes sense, at times, you might choose to process your transaction via a cashback site instead. Websites like Cashrewards offer consumers a refund of a percentage of their purchase for use of their portal. It’s similar to the Velocity eStore, but rewards consumers with money instead of Velocity Frequent Flyer points. Additionally, some retailers that are affiliated with the Velocity eStore are also affiliated with the Qantas Online Mall and cashback sites. Where this is the case, consider which portal would best deliver the rewards that make sense for your personal needs. 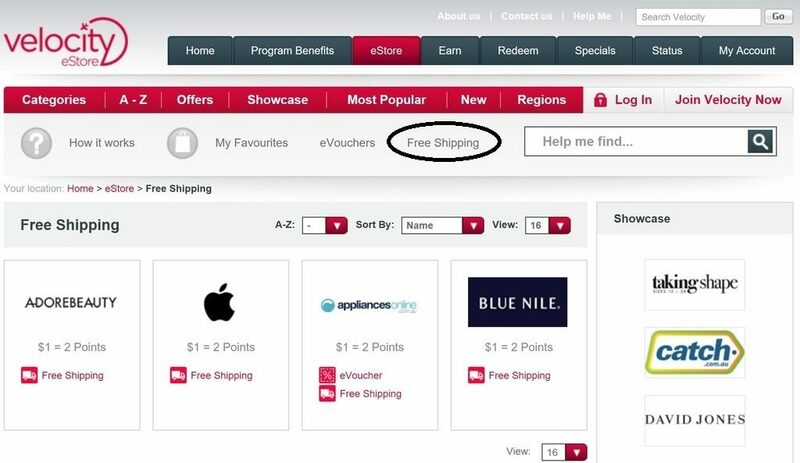 Shopping at the Velocity eStore is free and easy. It could help you boost your velocity points balance rapidly. The eStore can be particularly rewarding during promotional periods, where the points on offer at selected retailers can be boosted significantly. If you plan to shop online at a specific retailer anyhow, it may make a lot of sense to purchase via the Velocity eStore.